We sell seashells! 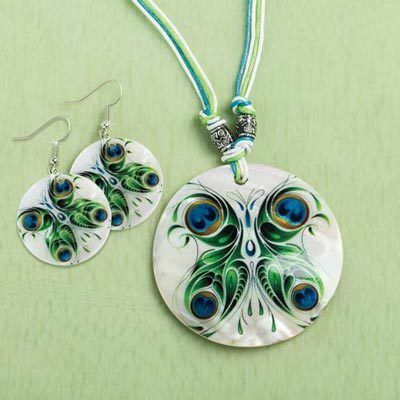 Our Luminescent Shell Jewelry Set is made of natural shell disks and bear a bold peacock feather and scrollwork design in vibrant shades of blue and green. Necklace features multicolored cords and silver-tone beads. Necklace, 16"l with 2. "l pendant; Earrings, French wires, 2"l.
I hope this comes back into stock soon as I want to order it!! !